Gentlemanly capitalism is a theory first put forward by P. J. Cain and A. G. Hopkins in the 1980s before being fully developed in their 1993 work, British Imperialism – a book I became very familiar with as a History undergraduate studying a very ‘old hat’ module on the economics of empire. The theory originally referred to British imperialism in the 19th century, which they argued was driven by the business interests of the City of London and landed interests, rather than the political machinations of the state. This important work carried a shift of emphasis, away from seeing provincial manufacturers and geopolitical strategy as important influences, and towards seeing the expansion of empire as emanating from London and the financial sector. With ‘Africa Rising’ dominating the political rhetoric of development organizations and business leaders in the 21st century, the City and its financial institutions are once again taking an interest in the continent, something we can see clearly with the rise of private equity (PE). This post considers how PE investments in Africa differ from their counterparts in developed market contexts, based on an event organized by the ICBS Venture Capital and Private Equity Society, during which an all-star panel of industry experts shared their views. What is the role of private equity in promoting sustainable growth? One thing that should be made unashamedly clear is that PE (in any context) is about making profits. It is not motivated by ‘sustainability’ or ‘development’ considerations, although you could argue from a market-based logic that the two go hand in hand, especially when considering the role that private equity plays in enabling capital flows and catalyzing growth of domestic businesses. The key constraints for private equity firms operating in Africa are: Firstly, identifying credible business opportunities with an attractive risk-return profile. Although investments vary in terms of size, credible opportunities depend on exit which in an African context, is the point at which you start to see ‘sustainable’ development spilling over from private investment. The second constraint is in acquiring talent,specifically finding and attracting talent in the right sectors i.e. those that PE firms tend to invest in. In oil and gas, financial services and telecoms there is no shortage of skilled managers, but when it comes to welfare infrastructure such as energy and healthcare good people are lacking, which is why you tend to see under-investment from a PE perspective. Even in more attractive sectors, finding talent is difficult but experienced operational managers are there to help with training PE-backed businesses, which helps to fill knowledge gaps. While many businesses lose this support on exit, after 7 years of accessing that experience and expertise it helps to develop local practices. Environmental, Social and Governance (ESG) reports are a condition of PE financing and tend to ensure sustainability goals are built into investments. What distinguishes PE capital investment in Africa from other sources of financing is that while much investment flows through the continent, it often doesn’t stay there. In terms of capability development and the efficient allocation of capital, this is where private equity is potentially quite different. Investments in Africa are more hands on than in European markets. The biggest deciding factor in a typical mid-market deal in Europe is backing the right management team i.e. so long as you have the right people, it doesn’t matter about the institutional context. However, you’re not likely to find that level of experience in Africa, so it’s best to either plug the gap or build-up the right people within the organisation. Does the small-medium-enterprise (SME) sector represent a scalable investment opportunity in Africa? A good example from East Africa, is that of a toothpaste company (and other personal care products), which had relied on debt financing initially, but as the company grew, it needed equity capital. This is where PE was able to add value. Looking across the capital structure in Africa, it is possible to get bank financing in the form of guarantees, such as from the Frontier Markets Fund, which in turn is designed to attract private sector capital. That said the small-medium-enterprise (SME) sector is simply a ‘no go’ – not necessarily a phenomenon unique to Africa, but is due to the fragmented nature of those investments, which would be better serviced by local (domestic) capital investment. Another point about SMEs is the question of opportunity cost and the fragmentation of the SME sector. It takes the same amount of time and effort to manage a £100m investment as it does to manage a £1m investment because good local managers are in such short supply. To plug this financing gap, there are commercial banks which provide a form of ‘local’ capital. Charging interest rates of up to 23% in some cases, they keep these businesses going. There seem to be few defaults in this sector suggesting it is an attractive market, but only once a business crosses the £20m turnover threshold does it get interest from PE. A good example of this is the Equity Bank in Kenya, which specializes in commercial lending to bottom of the pyramid (BOP) consumers, and symbolises a business that has real impact on the ground. That said, there is nothing ‘altruistic’ about the equity bank. They have won awards for sustainability, but they should really be winning awards for year on year profits, approaching 40% to 90% in recent years. The welfare impact is a side-effect of their activity but not the rationale. One PE invested in 2007, and it now has 600,000 bank accounts (1/3 of all accounts in Kenya) and generates significant revenues. This BOP segment was a market that commercial banks wouldn’t touch at first, which provided an opportunity for the private equity guys to step in, who got their exit when it floated on the stock market. Is the PE model right for infrastructure investments in Africa? No, it’s not really appropriate for the simple fact there are no adequate returns to be made on infrastructure projects in these contexts: ‘No one ever made money from building a railway… to see a return on investment you need to be the second or third guest at the party’. Infrastructure needs a different vehicle with a longer life span. It is a classic candidate for development capital. Building power stations, roads or railways in Africa is very different from a private finance initiative (PFI) project in the UK. In terms of power, this is a continent crying out for investment but private capital simply can’t make it work right now. By its very nature, these projects are closely linked to government where often the ‘C-word’ begins to crop up. Infrastructure projects can be at risk of corruption. Some power privatization in Nigeria is presenting an interesting investment prospect. However, most PE funds are not excited by it, if we take a similar example of the Kenya-Uganda railway, which has been regarded as a worthy investment, only once the previous owner – who lost everything – needed to be bailed out. There is a myth that PE funds are still highly reliant on development finance institutions (DFIs) for development capital to be invested in a project before coming in. People often ask when will we see a shift away such patterns, but this source of capital is especially valuable in infrastructure projects. Over time more PE funds and more institutional investors will be attracted. However, to put it into context, Helios is in the process of opening up their third fund in Africa, and are already 90% there in terms of achieving their target without a dollar of DFI money. If we look at PE funds in Europe, they are still promising the same returns as many developing market funds. But despite saying they will deliver 20% returns, most will do 10% under current conditions. On the other hand, in Africa funds are delivering 20% plus with a 2.5% base. They are having to deliver higher returns than other markets because investors are chasing the assumption of double digit return on investments (ROIs), expecting supercharged returns to recover the ‘Africa risk’, an assumption that is gradually changing. Companies such as the Equity Bank in Kenya show impressive profitability but these companies are hard to find. Most PE investments are also based on unlevered returns due to the fact there is no market for acquisition financing and so investments have to be based on pure growth. These kinds of investments can also go terribly wrong. What are the options for PE in terms of Exit? Although government allocations in terms of development financing are useful there has to be a transition away from it. PE in Africa represents an asset class that should be able to stand on its own two feet! Where do you stand on the China-Africa question? One anecdote just from walking around a factory in East Africa was when looking at the machines in the factory to see how much investment has come from external foreign direct investment (FDI) (see Figure 1). ‘What was interesting is there were no on/off buttons on the equipment, only Chinese characters. There is a distinct feeling that China in Africa is there to stay. Engineers and people on the ground had even learned Chinese Mandarin in order to speak with their investors and technology partners, many of the employees had only ever understood Chinese equipment’. 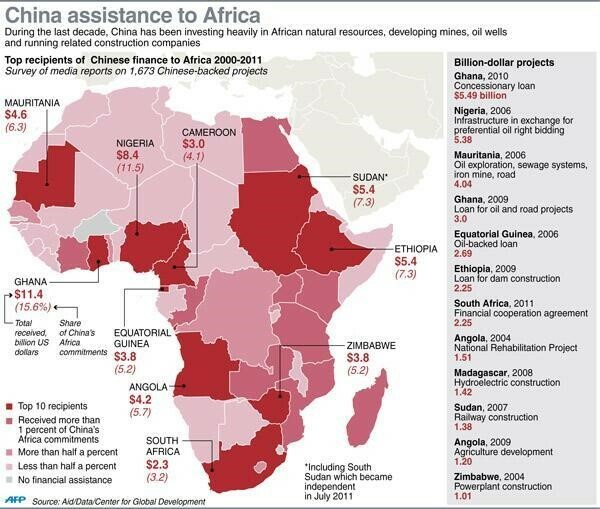 On the basis that China is in Africa for the long-term, the question is how to deal with it not how to reverse it. China is the biggest winner in terms of providing construction contracts to Africa, as well as overall international trade of finished goods and as suppliers of labour. While we have seen some backlash in places such as Ghana, it is really up to the US and UK to make up for lost ground as China has a much longer history in Africa than is generally understood, as suggested by a recent research paper. It is certainly true that in Africa it takes longer to ‘do the deal’. We spend far more time on the due diligence. That said, there are many similarities between doing a deal in Nigeria and doing a deal in Italy. Even from an advisor’s perspective, these are remarkable similarities. It’s not simply a case of doing a desktop review like you would do in a European leveraged buy out (LBO). In Africa there are times where you have to actually go and see the regulator to understand the potential impact of uncertain government policy. You have to get more creative when you assess a company’s (and a country’s) potential risk-return profile. What governance challenges are involved in managing portfolio companies? It involves placing the necessary checks and balances and assessing performance on a far more regular basis, every month instead of simply a quarterly board meeting. We define a set of key performance indicators (KPIs) and milestones, where management performance is assessed against internal and external impacts to firm performance. It is extremely important to create regular touchpoints and interrogate management accounts to a level of detail you would expect from any PE firm. Another key thing to remember about investing in African businesses, is not to do this remotely! Often there are issues of suppliers not being paid, which can make the company’s pro-forma accounts look a lot more attractive than they really are. It takes being there, on the ground to catch wind of anything that might be amiss. Going back to the ‘c-word’, good governance is important in all markets that PE operates in. We instituted mandatory training courses when the UK bribery act came into play for all our management teams. In Africa, this is where our competitors who are not so squeaky clean can pick up a competitive advantage and boost returns on the basis that they bend or more often break the rules. But we are happy to take a hit on our ROI in order to protect our integrity in the long-term. Where are the hot spots in terms of investment opportunities? People always mention Nigeria, and although this is not necessarily the hottest place right now due to current oil price fluctuations, it is one to look out for in terms of basic GDP growth. The Democratic Republic of Congo is certainly one of those quiet hot spots. The economy is doing better than you think, and it has a very large population, it has become surprisingly interesting in recent years. Sectors such as telcos and financial services present some attractive opportunities. Kenya is also very interesting, in fact there is a whole East African community which is moving together very fast. Ethiopia is in many respects the ‘dark horse’ of Africa. It represents a huge market and a growing opportunity that relies on the Ethiopian government continuing to pull its act together. Many PEs are accused of chasing the tail of the large development funds. This is becoming less and less the case, except perhaps for Sierra Leone where many advances and aid investment following the Ebola outbreak has kick-started potential investments. A fundamental point about investing in Africa, especially when discussing sustainable investments is that the solution to economic growth is in trade not aid. In terms of welfare and basic infrastructure investments there is still a lot of work needed to be done in exploring alternative vehicles for crowding in private capital. There are also many aid organisations that are beginning to follow a more ruthless market logic, which have proven to be extremely effective, for instance, if we look at the Children’s Investment Fund uses data analytics to observe where its investments can have the greatest impact. Similarly in the UK, new public-private partnerships investing in infrastructure in developing countries are showing how a market approach can help to crowd-in private capital, such as those based on the UK Green Investment Bank model, a PPP set up to counteract the market failure in the renewable energy sector. While many of these are in their nascent stages, it is a clear sign of some exciting financing models emerging in the near future. Posted in Inclusive Growth. Tagged Africa, finance, inclusive capitalism.